Save time and money when you combine your sauna with one of our radiant sauna tents! The Sauna Fix lamp produces red light, near infrared light, and mid infrared light therapy. Red and near infrared light are far more beneficial than far infrared light, since they have a biological response to the body’s cells. Far infrared simply heats up the water molecules to produce heat stress. The tents make for the most effective sauna therapy possible, as they trap the healing frequencies inside to constantly bombard the body with the beneficial near infrared rays from the Sauna Fix. No preheat is necessary with the use of one of these powerful tents, so you will not only have more time available in your day, but save on electricity. It’s a win-win! The tent is also easy to zip, retains 95% of sauna heat, and carries an "A" fire safety rating. The panels of the tent are composed of five layers: nontoxic wood grain film, space blanket, large diameter bubble wrap, space blanket, and nontoxic film. Only near infrared sauna therapy offers the bonus effects of blood shunting, which helps to double circulation benefits. Blood shunting ensues when the body heats up on the side that is facing the light, and begins to shunt blood in the direction of the skin’s surface to respond to the heat. The tissues engorge with blood and cool down with the release of water from the blood stream that becomes sweat. While rotating side to side in front of the near infrared rays, the body must redirect the blood shunting back and forth. This rotation is also beneficial in avoiding burns on the skin. No other sauna type can provide this fantastic blood shunting benefit. There are two sauna tent options available, so you can select the option that most benefits your lifestyle. Choose your way to sauna with the Convertible Radiant Sauna Tent design that enables three (3) different sauna session positions: standing, sitting, or lying down. Exercise or share your sauna with the significantly larger Hot Yoga Exercise Sauna Tent. This enclosure provides plenty of workout area, and an easy-to-hang partition that divides it into two separate NIR sauna chambers, so more than one person can sauna at once. Another radiant tent panel insert lowers the ceiling to the ideal height for a seated near infrared sauna session. There is no such thing as a non-EMF producing sauna, due to the fact that anything that plugs into electricity generates some EMF. However, we have done as much precautionary testing as possible to ensure our customers have peace of mind with their sauna system. The sauna has been tested in a number of categories and the corresponding results prove its safety. We invite you to look through the comprehensive testing performed on the Sauna Fix to ensure it meets our safety requirements. No other sauna competitor on the market has the third party testing to prove the safety of their products. In addition, no aluminum is found in the sockets of the light fixture. Get the improved look! The exterior of both tents are a golden wood grain design, and the chocolate brown coordinating trim improves the aesthetics of the original silver 2015 Sauna Fix Ultimate Bundle sauna. Extra features: The bamboo mats included with the new bundles feature radiant material backing. The wood of the mats was boiled, and then baked with high heat under pressure. 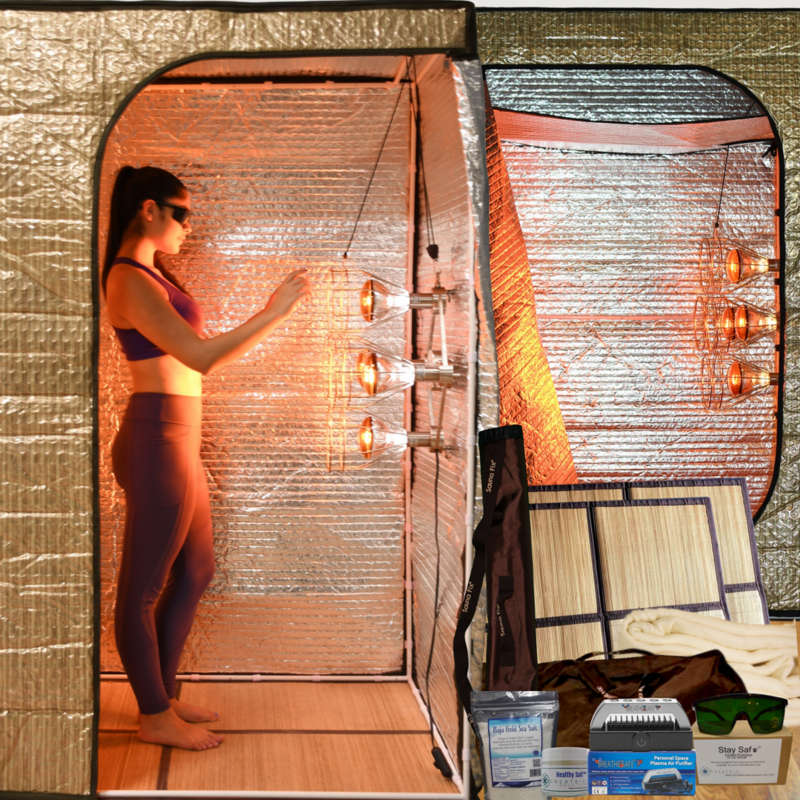 No near infrared tent sauna system on the market delivers the same portable, non-toxic, medical grade, ion and oxygen-rich, energy efficient, accessory-inclusive and low EMF sauna at such an affordable bundle price. Please recognize that bulbs are not included with the Sauna Fix. Visit this page for information on where to purchase bulbs to work with it.